House and time at Malvern: No 1, 1908 - 1913. Died: 13 September 1918 aged 24 in France. Died of wounds. Born 2 Dec 1894 in Shanghai. Son of John Clark Johnston and Frances E. Johnston, Oriental Club, London. Upper V—VI. House Scholar. House Prefect. XI Cricket; House XI Football. Heath Harrison Exhibitioner, Brasenose College, Oxford. Great War, 2nd Lieutenant 1st/8th Bn. Cameronians (Scottish Rifles) 1914, Captain. Husband of Ethel M. Johnston, of Sellarsbrook, Monmouth. 'Few boys have made more friends at School than did Donald Johnston, his sunny disposition making him a favourite with all who knew him. Eye trouble during the last year of his School life prevented him from trying for a Scholarship; but in both work and games he played a prominent part in the life of his House. On leaving Malvern he entered B.N.C. Oxford, where he spent a year, during which he was cox of his College Boat, and he played cricket for the 'Varsity, only just missing his "Blue." On the outbreak of war he applied for a Commission, which he received in October 1914, being promoted to Captain five months later; in 1916 he was given a permanent Commission, but was wounded in September of that year and sent home on "sick leave." 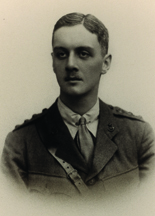 In June of the present year he returned to active service, but was seriously wounded in August; septic trouble supervened, and he died from heart failure on 13th September.' (Malvernian, Nov 1918). He was seriously wounded during the attack on Hill 158 near Beugneux which commenced at 4.15am on 1st August 1918 and took place in dense fog, shell-smoke and mustard gas. He died of his wounds 6 weeks later.